Over the past 25 years Prisoners' Education Trust (PET) has helped thousands of people in prison. We regularly receive letters from our learners and alumni about their achievements both in prison and back in their communities. People like Frank, who had been in and out of prison for more than 30 years before he found his ‘way out’ of crime through education. He is now in his final year at university. Search for their stories, experiences and views below. Some of their letters highlight the barriers that prevent people from learning in prison and through PET's work championing prison education we seek to address their concerns. Egerton's path to working in finance started in prison, when he saw a book about investing with a picture of a black man on the cover. Getting funding from PET allowed him to take the next step towards realising his ambitions and still inspires today. After leaving prison, Georgie set up a successful construction business. But his heart was in architecture, and last year he decided to apply to start a degree. He was accepted, only to be turned down once the university learned of his past. Now he's fighting for fairer treatment, lendng his voice to a campaign for fair chances. Michelle was 22, with a six-year-old daughter, when she received a life prison sentence. She was funded by PET to begin a degree which she went on to use to help vulnerable women in her local area. PET funded 'Moose', 46, for a counselling course in 2015 and a NCTJ certificate in journalism in 2016, which he passed this year. He wrote to us care of the education department of his Category C prison. 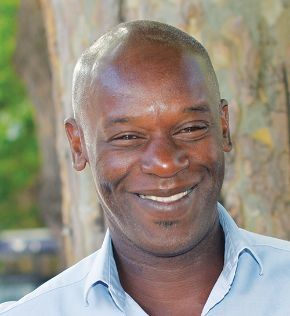 In early 2017, Simon Scott was appointed a trustee at PET, our first trustee with lived experience of prison education. He shares the challenge of representing all PET learners, and how he is working to create a community of learners to inform PET's work. In prison Javed found a sense of purpose and his calling to start an embroidery business. He talks about how he went from a prison printing workshop to embroidering shirts for one of the world's major football clubs. Emmanuel was 38 and serving a life sentence when he learned to read so he could write to his daughter - and later study alongside her. He shares his story. To mark the second International Day of Education in Prisons, we asked people in prison to submit poems, short stories and essays addressing the question: “Why does Education in Prison Matter?” We received dozens of submissions in each category, and a panel of PET staff and volunteers whittled them down to the strongest. In 2017, PET funded over 200 people to take GCSE, AS Levels and A Levels in prison, a handful of whom managed to take their exams inside. As they await, lament or celebrate their results along with students up and down the country, we asked them why they chose to study these subjects, what effect it has had, and what they hope to do next.